The Mills Novelty Company, Incorporated of Chicago, was once the world’s leading manufacturer of coin operated machines, including slot machines, vending machines, and jukeboxes, in the United States. Between about 1905 and 1930, the company's products included the Mills Violano Virtuoso and its predecessors, celebrated machines that automatically played a violin and, after about 1909, a piano. By 1944 the name of the company had changed to Mills Industries, Incorporated. The slot machine division was then owned by Bell-O-Matic Corporation. By the late 1930s, vending machines were being installed by Mills Automatic Merchandising Corporation of New York. The origins of the business lie with Mortimer Birdsul Mills, who founded the company in the 1880’s and went on to produce coin operated machines. Mortimer Mills had 13 children. One son, Herbert Stephen Mills, was born in 1872 when his father was about 27. In 1892, Bert E. Mills, the youngest of Mortimer Mill's children was born. In about 1895, Fred L. Mills, the first of Herbert Mills' sons, was born. Ralph J. Mills, Herbert's second son, was born circa 1898. In about 1900, Herbert Mills, the third son of Herbert Stephen Mills was born. His younger brother, Hayden ("Bill") Mills, was born two years later in about 1902. The Mills brothers were raised in Oak Park, Illinois, and continued to live in that area until the mid 1930s. In 1929, at age57, Herbert Mills died leaving a fortune to his wife and eight children. The business was continued by Frank W. Mills and Bert E. Mills. The two brothers had a number of patents to their name. We are very happy to report that we still have the entire original PATENT files of the violano for the company and can share these if a reader is researching a certain item. Mortimer Mills was granted United States patent 450,336 on April 14, 1891 for an improvement in “coin-actuated vending apparatus.” The improvement allowed the purchaser to select the product being sold and manipulate it so that it was carried to the point of delivery. Focusing on the devices covered by the patent, Mortimer Mills founded the M.B.M. Cigar Vending Company sometime between 1891, and 1895. Over half of a century later, the company would promote itself as having been founded in 1889, two years before the date of the patent, and by H.S. Mills rather than his father. In 1898, Mortimer Mills sold a controlling interest in the company to his son, Herbert S. Mills, and the name of the company was changed from M.B.M. Cigar Vending Company to Mills Novelty Company, Incorporated. At that time, the company was located at 125-127 West Randolph Street, Chicago. In 1904, Mills Novelty Company was an exhibitor at the Louisiana Purchase Exposition, the 1904 World’s Fair in St. Louis, Mo. Its pavilion was run by Ode D. Jennings, who would later establish himself as a major slot machine competitor to Mills. In 1906, Bert Mills left school at the age of 14 to work for Mills. He would later establish a separate company, Bert E. Mills Corporation, and, in 1946, help to develop the world's first successful vending machines to sell hot coffee. In 1907, Herbert S. Mills collaborated with Charles Fey, the inventor of the slot machine, to produce the Mills Liberty Bell. In 1926, the company had moved from Green Street, Chicago to a plant of 375,000 square feet, comprising a factory and administrative building, at 4100 Fullerton Avenue in northwest Chicago. Mills would distinguish itself by being one of only a few firms to manufacture both machines for gambling and vending machines. In 1928, Mills entered the market for coin-operated radios and multi-selection phonographs. 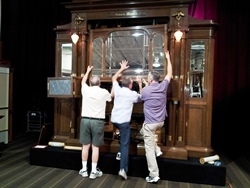 Between 1929 and 1948, the company manufactured and sold jukeboxes by the names of Hi-Boy, Troubadour, Dancemaster, Do-Re-Me, Swing King, Zephyr, Studio, Throne of Music, Empress, Panoram, and Constellation. By May 1935, the company was run by the four sons of Herbert Stephen Mills: Fred L. Mills was President, Ralph J. Mills was Vice President in Charge of Sales, Herbert S. Mills, Jr. was Treasurer and manager of the plant, and Hayden Mills was Secretary. The family's wealth included a private yacht named Minoco, after the family firm. In about 1935, Mills was engaged by Coca-Cola to produce a standing dry automatic cooled vendor for bottles. The result, the model 47, was the first of its kind for Cola-Cola. By the late 1930s, gum vending machines were being installed by Mills Automatic Merchandising Corporation of New York. The machines made use of technology protected by United States patents assigned to Mills Novelty Company, including number 1,869,616. During this period various pinball and other machines were also invented. Including the now famous "Panoram" which sold in the thousands, and was truly the forerunner of modern day MTV! The machine played black and white "soundies" and was extremely popular during the WWII period. During World War II and by April 26, 1944 the name of the company had changed from Mills Novelty Company, Incorporated to Mills Industries, Incorporated. On April 26, 1944, a representative of the firm, D. W. Donahue, was appointed to a planning committee of the coin machine manufacturing industry. The committee was concerned with the transition of the coin machine factories from war production back to their former use. In July 1944 Fred L. Mills, the then President of Mills Industries, died at the age of 49 of a stomach aliment in St. Charles, IL. During World War II, Mills received authorized federal funding to use its industrial facilities to produce bomb carriers, directional antenna, hand control slip rings, and poppet valves. They continued to produce "Panorams" with films directed to the war effort and morale boosters. On April 1, 1946 Bell-O-Matic Corporation was established as the exclusive distributor worldwide of all Bells and related products manufactured by Mills, and employed all of the former personnel of the Coin Machine Department of Mills. The stated rationale for the change was that the market for the products of the Coin Machine Department and the markets for the other products of Mills were quite distinct. The last jukebox produced by the Mills Novelty Company was the Constellation (model number 951). At the end of the Constellation production run, a couple of boxes of the front grille medallins were sold as "scrap" to a Mr. Tucker of Chicago. In 1948 these became the horn button in all known Tucker automobiles! By January 1948, the company was financially troubled and had petitioned the federal court for time to pay its debts. In December 1948, the company sold its entire phonograph inventory to H.C. Evans of Chicago. By the end of the 1940s, the Chairman of the Board of Mills was Ralph J. Mills and the President was Herbert S. Mills. Both men were Vice Presidents of Bell-O-Matic Corporation, whose officers included President V. C. Shay and Vice President in Charge of Advertising Grant F. Shay. 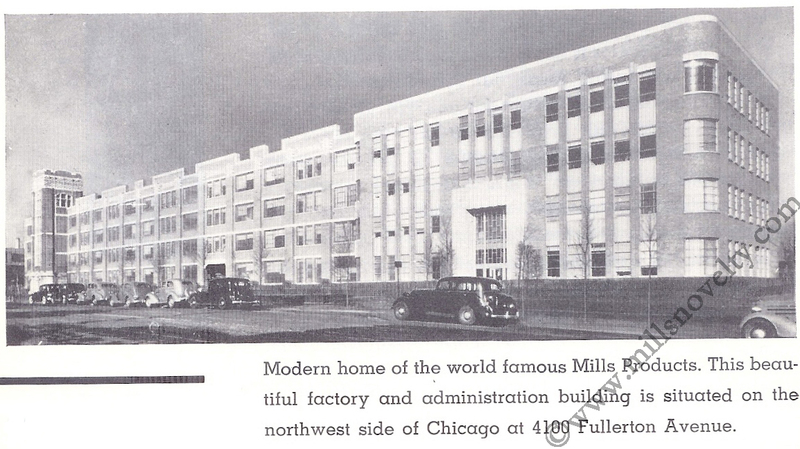 Both companies were still located at the Mills building in Fullerton Avenue, Chicago. The Bell-O-Matic Corporation would later relocate to 135 Linden Street, Reno, Nevada. In January 1951 it was reported that the industry manufacturing slot machines in the United States, then almost entirely based in Chicago, IL, had suffered a major blow. A bill had been signed which banned slot machines from federal property and prohibited their shipment in commerce between states. At that time slot machines were allowed only in the states of Nevada, Montana and Maryland (where they were only legal in four counties). But they continued to be operated illegally throughout the country. In October 1954, F. L. Jacobs Company, a manufacturer of automobile parts based in Detroit, Michigan, announced that it had acquired both Mills Industries, Inc. and Selmix Dispensers, Inc. of Long Island City, NY (another manufacturer of equipment in the vending and dispensing industries.) At that time the main products of Mills Industries were commercial ice cream freezers, frozen custard and milk shake machines and all types of vending machines. During 1953 and 1954, the company had added a new coin-operated coffee vending machine, a three-flavor beverage bottle vendor, a citrus fruit juice vendor, and an ice cream package vendor to its product line. The intention of F. L. Jacobs Company was to operate Mills Industries as an independent subsidiary. Component parts for the equipment were to be produced in the factories of F. L Jacobs in Detroit, Traverse City, and Danville, IL. By September 1954, the controller of Mills Industries was James A. Pound. In November 1955, Mills Industries announced a project to consolidate, over a number of years, most of its operations into Traverse City, MI. TJM Corporation was operated by Tony Mills and his brother John Mills. The merged company failed to compete successfully with the electro/mechanical models produced by Bally and also suffered because it had not protected its intellectual property rights in Japan. The company eventually closed its doors in the 1980s. We are saddened to report that David A (Tony) Mills passed away June 6, 2009 at his home. He was a resident of Las Vegas, NV for the past forty-two years. Tony was always willing to share his family experiences and knowledge of the early days of Mills Novelty Co. in Chicago with wonderful stories. He will be missed by all that knew him. The name "The Mills Novelty Company" still survives today, in the form of a business that restores antique Mills violano instruments (self playing violin and piano), and manufactures a computer based digital system for the antique Mills Violano Virtuoso instruments. It also manufactures a digital player system that will operate any MIDI equipped new or antique mechanical musical instrument.